Whether you are handling cleaning products with chemicals at home or working with chemicals in a school chemistry lab, being aware of chemical safety tips helps to keep you safe from possible danger. Regardless of where you work with chemicals or products containing chemicals, it is important to remember that these types of products have the potential of being extremely harmful and dangerous if they are used incorrectly, or incorrectly mixed with one another. Being aware of the following safety tips regarding chemicals, and products containing chemicals, will help protect you from a possible accident and injury. Keep the telephone number of the Poison Control Center near every telephone. Never combine any products that contain ammonia and chlorine bleach. When these common household substances are combined, they form a gas that is highly toxic and can result in serious breathing difficulties or death. Always take the time to read the warning label on any chemical product you use. The label provides safe guidelines for using that specific product. In addition to the information on safe usage, the label also generally provides information on safe storage and gives instructions on how to protect yourself properly when using the product such as the need for protective gloves, eyewear or ventilation. The label also includes the contact information for the manufacturer of the product. Always follow the manufacturer's safety recommendations when using any chemicals, products that contain them or any other substances that are hazardous. Never store a chemical in anything other than its original container. Containers, other than the original product packaging, are generally not capable of storing the chemical safely. In addition, pouring a chemical product into an empty plastic soda bottle or empty plastic milk container can result in a deadly accident if a child, or even an adult, mistakenly thinks the liquid inside is something to drink. Always keep all chemicals and cleaning products safely locked up or out of their reach of children. This includes pool chemicals, household chemicals, cleaning products, poisonous products and paints. Store all chemical and cleaning products away from areas where pets have access. Store chemicals in a dry, cool place away from stoves, heaters and pilot lights. Clearly label or mark all hazardous products when they are stored away. Do not store any chemical or other hazardous products near any food or items used to prepare food. This includes all food products, silverware, cooking utensils, cutting boards, pots and pans. If you experience any dizziness, lightheadedness, nauseousness or get a headache, get to fresh air immediately. Make sure the area where you are working with the chemical or cleaning product is well ventilated. Open the windows and use a fan in the area. Wear the protective clothing recommended by the manufacturer. 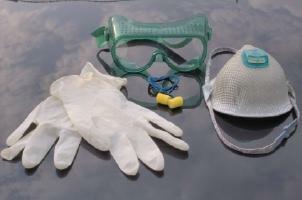 This could include gloves, protective eyewear, a mask, a long sleeved shirt and long pants. If you must leave the room, or the area where you are working with the chemical, either take it with you or put it away. Never leave it unattended. Contact lenses should not be worn when using chemical products. If the chemical gets on your hands or any other part of your body wash the area immediately using warm soapy water. Do not light a match or use a lighter near any chemical. If you do not know how to properly dispose of a chemical product, contact the local waste management office in your area. They will be able to tell you how to properly dispose of it. Properly dispose of any products containing chemicals if the expiration date of the product has passed or if the product does not look right. Properly dispose of any products containing chemicals if the container shows any signs of corrosion, rust or leakage. Being aware of the dangers that could exist, and following chemical safety tips and rules, makes using chemicals much safer. It is important to always remember to be cautious when you are working with chemicals and products containing them.